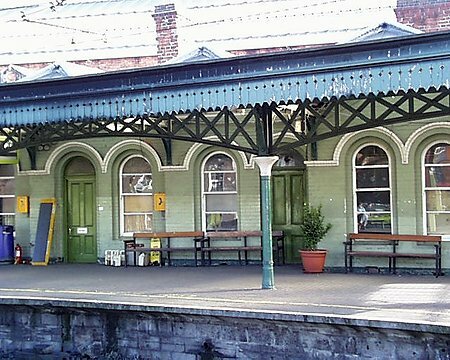 Originally constructed for the Drogheda and Dublin Railway Company, this was the first of the four major Dublin Railway termini to be constructed. Still in use today, it has been renamed Connolly Station after James Connolly who was executed for his part in the 1916 rising although many people still refer to it as Amiens Station. The station was built between 1844-46, and it is constructed on an axis with Talbot Street allowing the central tower to act as a signpost for the station. A symmetrical five bay façade with three towers and an enormous entrance arch – the main façade does not hang together particularly well as an integrated design. In the late 20th century Iarnród Éireann Architects renovated the building by adding a new entrance foyer to the south and cleaning the brickwork inside the shed. In addition to the mainline trains, Connolly also services the local DART and Suburban Rail services. These trains operate from platforms adjacent to the main railway shed, on an elevated railbed before crossing the river via the Loopline Bridge. The removal of the traffic access ramp to the south has allowed a terminus of sorts for the Luas Light Rail system, which had now been negated by the extension of the route to the Point on North Wall Quay.